Well, as promised, I plan to tell you about another book I've finished recently, Jim & Casper Go to Church by Jim Henderson and Matt Casper (Tyndale, 2007). This is an intriguing book: it pairs a pastor-evangelist-church consultant with a professing atheist as they travel America and visit well-known as well as obscure evangelical churches. Most of the book is a debrief of their experiences; we get to eavesdrop on a conversation that is direct, respectful, and sometimes, painful. This is refreshing: too often, especially in church circles, we tend to beat around the bush, avoid awkwardness, and put a good spin on our real opinions. Here, there are no holds barred, particularly as Henderson (the Christian) creates a safe space for Casper to share his thoughts in straightforward, if brutally honest, ways. You may remember Henderson from earlier news reports: he's the Christian who successfully bid for a man's soul on EBay! What I like about Henderson is that he models a genuine, dialogical approach to evangelism. Rather than telling, he asks. He listens. He even apologizes for historical Christian abuses and insensitivities, where appropriate. Above all, he stresses the importance of honest relationship, what he calls "defending the space", that sacred space of trust between two people genuinely seeking to know each other. Too often this space has been crushed or obliterated by Christians heaven-bent on saving souls, rather than doing the hard work of relationship, with all its messy engagement. Jim and Casper go to eleven churches, to be exact. Their visits include the famous megachurches of America (Saddleback, Willow Creek, and Joel Osteen's Lakewood Church), the hip emerging churches (like Erwin McManus' Mosaic, Imago, and Mars Hill), some older mainline churches (like First Presbyterian of River Forest, IL--ouch), and at least one mega racial-ethnic church (T.D. Jakes' The Potter's House in Dallas). It's great to listen in on their dialogue, particularly Casper's opinions. He's very alert (allergic?) to showiness, shallowness, and pretense of any sort--possibly reflecting his age (30s). He repeatedly asks about "action"--how are churches and Christians seeking to serve the poor, the homeless, the needy? He's not as impressed by a fancy building or state-of-the-art technology or music as he is by humble service in the community. Through the course of the book, Jim and Casper help us glimpse some of our blindspots (forced friendliness in our greeting of visitors, manipulative displays of emotion in sermons, predictable song pairings, etc) and they show us the importance of a Christianity that serves, rather than shouts. Jim and Casper Go to Church is a great read for Christians who've either purposely or accidentally stayed too long in the Christian ghetto. It's refreshing to hear how we're viewed from outside and to have a book like this model for us ways of conversing that are real and not manipulative. One thing each of us churchgoers might consider: why not follow the authors' lead and invite a non-Christian to church solely for the purpose of evaluating how we're doing? Henderson did this (and even compensated the atheists!). Then humbly ask our visitors for their honest response. Could be insightful. My review of the book: Two thumbs up! Pair it with another of my favorites on culturally-appropriate evangelism, Finding Common Ground by Tim Downs, and you've got some challenging, inspiring reads. From time to time, I get requests for book recommendations. I'm happy to oblige. This summer I've already enjoyed two very different books, both of which accompanied me recently to Hawaii. The first was a book by British theologian and Anglican churchman N.T. Wright (who's fast becoming one of my favorite Christian thinkers and writers). Wright writes telephone book-sized theological tomes on Jesus, Second Temple Judaism, and the Apostolic Church. He's a New Testament scholar and one who's surprisingly readable. Hang in there. Don't let me lose you. He has this amazing knack for making theology palatable, even appetizing. He takes dense theological and biblical matter and makes them accessible for the intelligent layperson. He's a hero of mine, kind of a C.S. Lewis meets John Stott meets Dale Bruner meets Earl Palmer kind of guy. Anyway, he writes these doorstop-sized books that are hard to lift but rewarding to read. He also writes more popular works that are slimmed down but not dumbed down. He has a great gift for summarizing his scholarship and making it practical, relevant, and inspiring. His book Simply Christian is the new Mere Christianity, in my opinion. His book The Last Word gives a sane, thoughtful, non-polemical introduction to the Bible and its authority for today. 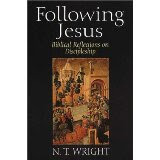 But the book I've just finished is his little Following Jesus: Biblical Reflections on Discipleship (Eerdmans, 1994). What a great read! Along with my pineapple and mango, I nibbled a chapter each day for my personal devotions. In the first half of the book, he spends a chapter each on several New Testament writings (for example, Hebrews, Mark, John, Matthew, Revelation). He gets to the heart of each book and turns it inside out in a way that not only helps you understand that book like never before, but actually inspires you to live its theme! This is really, really good stuff. I'd recommend it for anyone wanting some thoughtful, moving material for reflection, prayer, and spiritual formation. The second half of the book touches on vital biblical themes: resurrection, heaven, hell, tranformation, those kinds of things. Also, very helpful! I think these were originally sermons--giving me that much more appreciation for a scholar who can speak in the vernacular and make the Christian faith relevant to where we each live. Great stuff! Greetings, faithful reading friends! Apologies for the silence on this end--I've been vacationing the past 10 days in the Hawaiian islands with my family. It was a great trip--and a return to the birthplace of my faith, believe it or not. Twenty-six years ago in August I visited the islands of Oahu and Kauai and during that two week period, many things converged to erode all my resistance to following Christ. I left for Hawaii a seeker and returned a believer. Seeing the lush beauty of Kauai again reminded me of the power of God's goodness and artistry revealed in creation--a strong factor in tipping the scales toward belief for me. There's something about Kauai's unspoiled majesty, particularly along the Na Pali coastline, that bears witness to God's creative genius. The trip also gave me the chance to do something off my personal "bucket list"--to ride a bike up Mt. 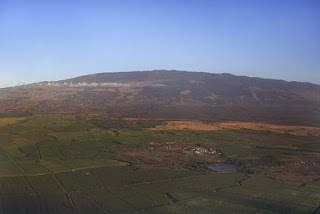 Haleakala (literally "House of the Sun") in Maui. 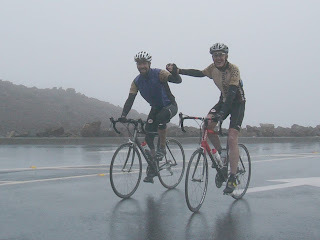 Steve Hawkins and I (along with our faithful sag driver, Linda Hawkins) summitted the extinct volcano on June 11. 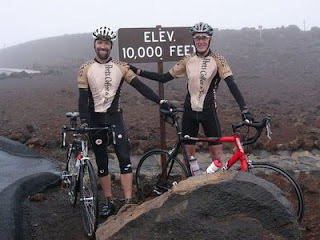 It's the only place on the planet (that I'm aware of) where a cyclist can ride a continuous paved road up from sea level to over 10,000 feet--and do it in just 36 miles! It was a tremendous ride: unrelenting and visually stunning (until a constant downpour obscured our views above 5000 feet). It's an optical illusion: from a distance the slope to the summit looks very gradual, but the mountain forms the entire eastern half of the island and it's much bigger that it looks. 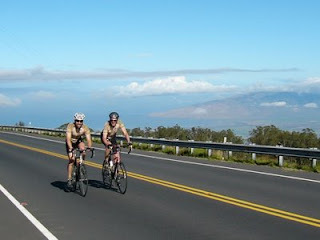 For those interested in doing this climb, Steve and I recommend Donnie Arnault's gocyclingmaui.com bike shop in Haiku for rentals--excellent bikes, well-maintained, at a great price. It doesn't hurt that Donnie's the go-to guy for people like Lance Armstrong, Andy Hampsten, Floyd Landis, and others who do the ride too!